Anthroposophy is the work of Rudolf Steiner, the Austrian philosopher and academic. Born in Croatia in 1861, Steiner died in Dornach, near Basle in Switzerland, in 1925. He was considerably influenced by Goethe, the naturalist, dramatist and poet. Goethe’s scientific work had occupied Rudolf Steiner at just 20 years of age. Steiner also completed a study of Goethe’s morphological writings, and was in Weimar between 1890 and 1897 to contribute to the publishing of Goethe’s complete works. During that time, he was also responsible for publishing the Colour Theory, for which he composed a preface and edited the notes. After moving to Berlin, he joined the Theosophical Society, but resigned in 1913 to found his own Anthroposophic Society, based in Dornach — where his Goetheanum was later to be built. Steiner’s anthroposophical theory emphasises the theosophical interest in nature, the fate of mankind and the process of spiritual release marking human history. The starting point of his anthroposophical theory is the division of the human being into seven principles, as well as the cycle of reincarnation dedicated to an eventual return to the universal spirit. Anthroposophy originated at a time of deep crisis for European society and culture. The new theory fascinated with its particular attention to form, and was both rapid and successful in furthering a new culture of artistic activity. Eurythmics (the art and therapy of movement, transformed into motion through words and music), the attention paid to nature and its morphology, the application of colours and the spiritual experiences of anthroposophy were a constant source of influence for many European artists in the period between the wars. Steiner did not write a colour theory as such, although in a number of lectures and essays in which material relating to Goethe‘s theory was included he did describe a few principles on how the phenomenon of colour can be interpreted. These principles are closely associated with his philosophical and spiritual theories. The corner stones of the anthroposophical approach to colour can be found in three lectures in particular — held in May of 1921, in Dornach. Along with other writings, they are included in the volume The Essence of Colours. Green is the plant covering that envelops the earth. In addition to its «physical body», the plant possesses an «etheric body» which defines its actual life. Green is the dead image of the life within the plant. Peach blossom, on the other hand, is the «colour of human incarnation», the «colour of human skin». This colour explains the moment when the human soul withdraws from the face, and the face assumes a greenish hue. Accordingly, says Steiner, we can view peach blossom as the «image of the soul», and more exactly, as the living image of the soul. Steiner emphasises that death does not lurk behind peach blossom (as is the case with green), since when the colour of peach blossom disappears the soul will indeed withdraw, but not life itself. White is related not to an existence in the outer world, but to light and — through cosmic experience — to the sun. Steiner observes that there must be a special relationship between white, which shows itself as a colour, and light. Light is not perceived in the same way as other colours. Rather, it is equally a condition of the perceptibility of colours, and is necessary in order to reach the Self: «It connects our Self, in other words our spirituality, with this state of translucence … the Self is intellectual, but must experience the soul». White, or light, is thus the «soul’s image of the mind». Black is the darkness. In nature, the experience of black is related to carbon. As white tends to point inevitably to black, so carbon points to the transparent. Carbon «can also be light and transparent — it is, after all, a diamond». If white is painted upon black, the white surface will be permeated by the spirit: «Black represents the mind’s image of the dead». At the end of this first lecture, Steiner summarises the four colours under investigation: «Green is the dead image of the living, peach blossom the living image of the soul, white or light the soul’s image of the mind, and black is the mind’s image of death». Each of these colours is not real, but only an image, and they are thus named «image colours». 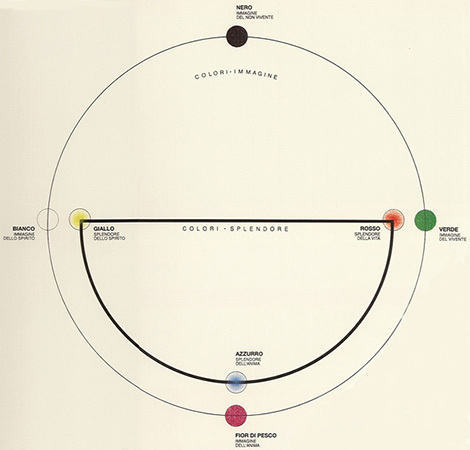 Steiner connects the four colours in a circle: from black — the mind’s image of the dead (mineral kingdom) — to green, the dead image of the living (plant kingdom) — to peach blossom — the living image of the soul (kingdom of the soul) — to white — the soul’s image of the mind (kingdom of the mind) — and finally from the mind to death, or to black. The model is contained in the drawings which form part of a written lecture text. This portrayal gives prominence to the sequential process, which is also experienced as an intensifying and enriching process in which each subsequent element retains something of its predecessor. In addition to the four image colours, Steiner analyses the three radiant colours of blue, red and yellow. In the illustration, in order to maintain a connection between the complementary colour-pairs of the traditional colour-circle, these are inscribed along one of the semi-circles inserted into the large circle. It is evident that the theme of the three and the four, the triangle and the square, common to the spiritual tradition of Western and Eastern systems is repeated in the anthroposophical system. A semi-circle has been selected in place of the triangle so as to better capture the Steiner spirit, which tends towards soft, flowing transitions — between forms as much as between colours. Yellow is the colour which must be «nourished» from the centre. It must — with brilliance diminishing outwards — be able to radiate. «Yellow, from its intrinsic nature, wants to become weaker and weaker at its edges; it wants to radiate» … «Yellow has no voice when restricted». Blue does not assume any uniformly coloured surface. «Blue becomes congested at its edges and runs back into itself, to create a barrier around a lighter blue. It will then reveal itself in its original nature». «Red wants to be uniform and have no limits, but take effect as a regular and quiet red. It wants to neither radiate nor congeal, it wants to be inwardly and uniformly effective, it wants to maintain a mean between flow and congestion». The nature of the relationship which exists between colours of the anthroposophical system can also be expressed as a wave-formed rhythm, where colours, arranged according to the colour-circle, oscillate between image and brilliance, contraction and expansion, concaveness and convexity, and the inner and outer of an ideal circular line. The second illustration shows this rhythm — it has been taken from the second Dornach lecture and depicts the following sequence of colours: the image colour green follows the radiant colours red-yellow (segment); from there, the way leads to the radiant colours blue-violet (segment) and finally the image colour of peach blossom. Steiner writes that white and black, because of their polarity, seem to possess a mysterious privilege when compared to other colours: «Mysteriously, however, underlying all things are the two other image colours, white and black». Black and white form the extremes of the image colours, the start and the end of the continuous cycle that completes the essence and the experience of colour. The three smaller illustrations show a similar, in this case geometrical problem. Here, too, the same creative rhythmic course wends between outer and inner, and can be compared with the course between image and brilliance in the anthroposophic system: a point P outside the circle always corresponds to p (the line within the circle connecting the two tangents drawn to form a cone section). In the reverse situation, a straight line p outside the circle will always correspond to a point P inside the circle. In the tangents, pole and polar, outer and inner will coincide. 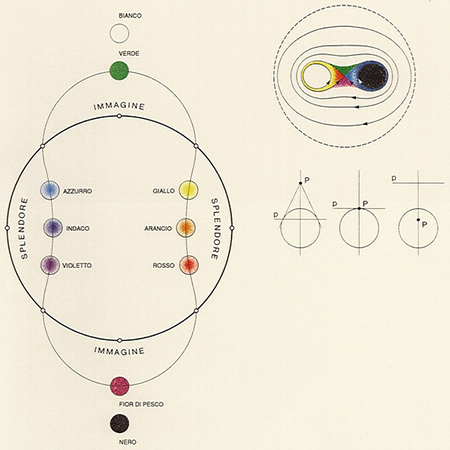 In the final illustration, the seven colours are arranged as a system of curves from Cassini. This family of curves of the fourth order, which link the continuous and the interrupted systems, can be seen in the work of Steiner (particularly in his sketches for the construction of the Goetheanum in Dornach — the headquarters of the anthroposophical movement). The image colours are in one field; the brilliant colours in the other. The hubs are occupied by white and by black and constructed as centres. According to the laws of poles and polars, however, to be the centre also means to be infinite — the absolute inner and the absolute outer become one. The complex system of curves from Cassini, which represent the arithmetic operations of multiplication, open many possibilities for interpreting the creative relationships between the colours. Date: Our portrayal is mainly based on three lectures by Rudolf Steiner held in May of 1921 in Dornach. Steiner’s interest was in The Essence of Colours. Bibliography: R. Steiner, «Das Wesen der Farbe», third edition, Dornach 1980; J. Pawlik, «Goethe Farbenlehre», Verlag DuMont Schauberg, Cologne 1974; H.O. Proskauer, «Zum Studium von Goethes Farbenlehre», Zbinden Verlag, Basle 1977.